Were you saddened by the recent news that Hulu was no longer available on the TouchPad? Concerned with the inability to watch your favorite web shows as soon as they were made available online? Or maybe jealous of your iPad-toting friends who could launch their Hulu app at any time to get a peek at what was on? Put your woes away, weary worryer; Homebrew developer PuffTheMagic has released a Linux Application into the Preware catalog that will fix all of your problems, and you can get it right now with only a few minutes of work. No more long coding and file management processes either - just a simple tap of a button. Launch Preware by WebOS Internals if you have it installed (and if you don't, get Preware Homebrew Documentation from the app catalog or go to the WebOS Internals website to learn how) and head to the "List of Everything" that is currently available. If you do a search for "Hulu Fix", you should see a single item available for installation by PuffTheMagic (it shows as a patch in the catalog but will be organized as a Linux App after install). Hit that install button to get the process going, once it's finished the entirety of the Hulu TV and Movie library will be made available right on your device through your web browser of choice. 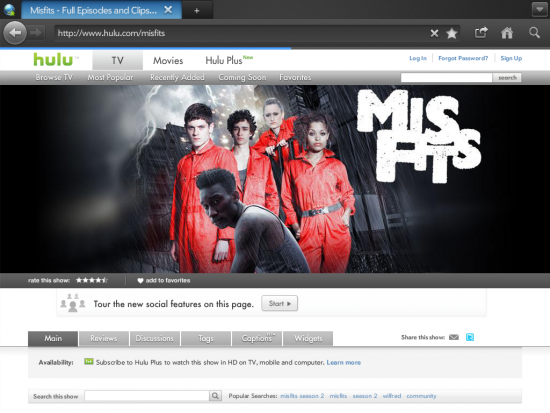 What was once a familiar process of typing hulu.com into the JustType search bar and heading to the website will become all too familiar once again. Long live webOS. Long live homebrew.